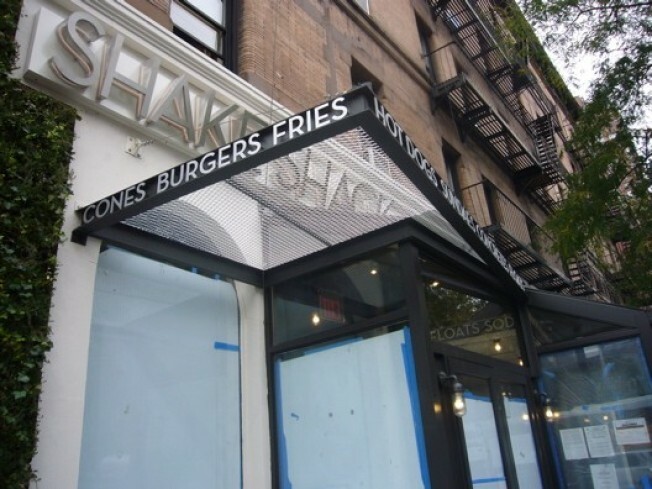 Current Debut Projection: The latest from USHG, "Mid-October"
Take a gander, if you will, at the soon-to-be-unveiled glory that is the Upper West Side Shake Shack. We took a little preview walk through today, as did Sir Danny Meyer and his fam, and we have to say she's looking pretty good. And the burgers: oh they traveled well. But let's start the tour at the beginning. The entrance: According to managing partner Randy Garutti, the signage outside of the Shack, complete with LEED lighting, can be seen from Central Park. Instead of an enclosed sidewalk seating area like they have, they originally planed to install garage doors (a la Barbuto), but the idea was reneged by the community due to some landmarks issues. Main floor: As mentioned, we now have a C line, replacing the Mad Sq. Park B line, that is designated for anything cold, including milkshakes, concretes, custards, etc. Catering to the nabe, we've also got a stroller parking area and, natch, some little Shake Shack onsies on the merchandise wall. As for seating, we have the enclosed but somewhat open little "sidewalk cafe" with the downstairs dining room and Central Park providing the overflow seating. Rec Room: Downstairs they have extra seating/a private party room where every kid on the UWS will throw their birthday parties. Garutti is also hoping for holiday parties, Super Bowl parties, business meetings (the TV is hooked up for Power Point) and the like. The Kitchen: She's a big one. The milkshake station is over twice as big as the one downtown, since milkshake orders much to blame for the long lines. The griddle for the hot dogs is a new design for the Shack team (it rolls the dogs while cooking them, but not in a 7-Eleven way), and the new bun steamer arrived after Garutti took research trips to Chicago's best hot dog spots and discovered the secret to a great bun is a good old fashioned steamer. The burgers: Along with the fries and the shakes, just like downtown. tktk.